Dr. Chugay’s technique allows the most aggressive and natural-looking results to be accompanied by the fastest recovery possible. He has appeared in the news on multiple occasions, discussing this technique. Its various elements have been presented to other surgeons at multiple conferences around the world with the hope of teaching others how to produce a better looking face-lift. The following revolutionary techniques are included in the Vertical Facelift. The well-known behind-the-ear scar is altogether avoided by making the behind-the-ear cut inside the back of the ear short and extended into the back of the hairline to minimize the scar visualized post-operatively. 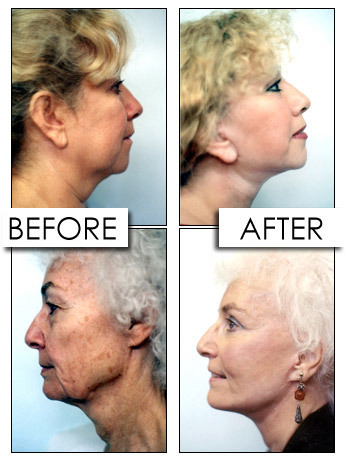 What Makes Dr. Chugay’s Facelift Vertical? and Why? In the Vertical Facelift, patients can expect some swelling of the face and eyelids and some discoloration is common with any type of facial surgery. This is most notable on the second and third days and diminishes in approximately one week. However, this also depends on your type of skin, age and healing ability.